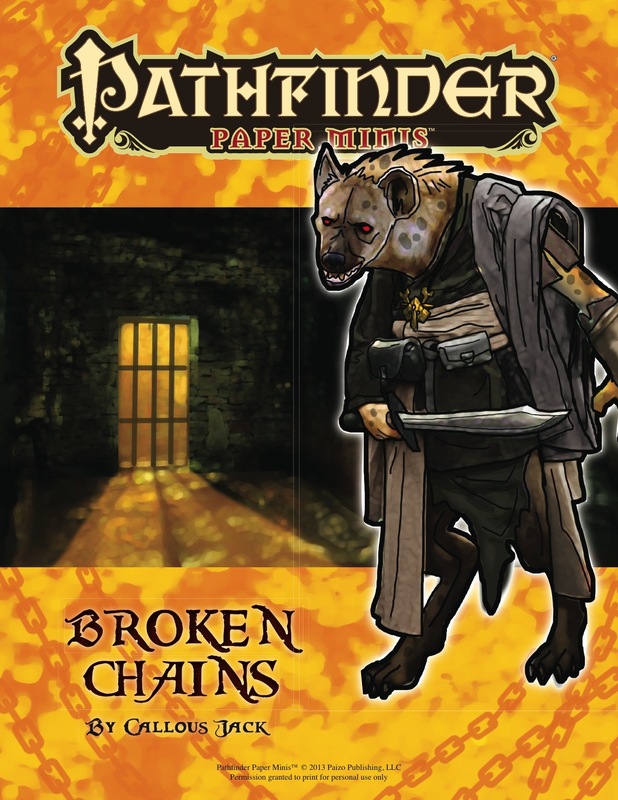 This Pathfinder Paper Minis set contains everything you need to run the "Broken Chains" adventure! Filled with cruel slavers and cultists, you'll have 80 miniatures to populate your tabletop game! If you bought the module, you should buy these minis as well, because there is no better way to describe the black milk mother than to just put her mini on the board. The art goes well with the normal pathfinder bestiary. There is a good collection of NPC desert dwellers and thugs, some beasts and bugs, 4 well drawn slaves and several city gnolls wearing normal clothes. Half the minis can bee easily recycled for Legacy of Fire. My favorite find was Ukrammak, as it’s almost impossible to find a good picture of a gnoll casually wearing a cloak. With a little tweaking it was just what I needed for my PC. Thank you Callous Jack. It's quite a nice set, with artwork detailed enough to be "blown up" for use on a virtual tabletop. My one quibble: No Black Milk Mother! Thank you, John. I already did the BMM but I guess I forgot to put her into the set. I will get it updated in the next day or two. Very nice! My players will not be mistaking that for an unchosen. I'm a big fan of these coming out and the art works really well. Thanks Paizo and crew! Thanks ShaperMC, glad you liked them! Newbie question here: how to assemble ** spoiler omitted **? swarms can take either the shape of a cube or a line, it's easier to set them up as tokens, rather than stand-up figures. Simply cut out the squares and lay them flat on the play surface. Finished this adventure tonight. The reaction my players had when I pulled out the Black Milk Mother was classic. Looks like I'll be running this in the middle of a PFS Thornkeep campaign to make the levels work, so this would be the perfect time to give the paper minis a shot. Awesome, I hope to see some pics! A big thank you to Garrett the Gnoll for his review.